“We always joke about the difference between shepherd’s pie and cottage pie in our house. It’s easy – shepherds have sheep! 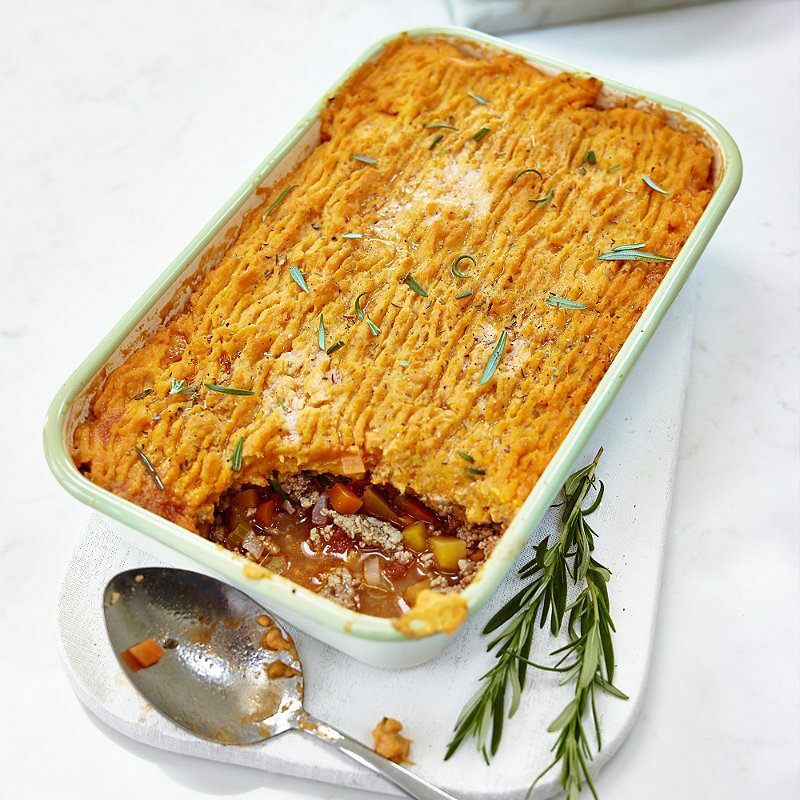 The sweet potato topping is awesome and makes a welcome change from regular mash” – Davina McCall. While the meat is cooking, you can make the sweet potato mash. Preheat the oven to 200°C/180°C Fan/Gas 6. Put the sweet potatoes on a baking tray and bake them for 45 minutes or so until soft. Remove them from the oven but leave the oven on. As soon as the sweet potatoes are cool enough to handle, split them open and scoop the flesh out into a bowl. Add the è fraiche, season with salt and black pepper and mash thoroughly. To assemble, put the meat mixture in an ovenproof serving dish. Spoon the sweet potato mash on top, spreading it out evenly and making sure that none of the meat bleeds through, then fork up the mash slightly for a rougher finish. Dot with a few small knobs of butter. Bake the pie in the hot oven for about 40–45 minutes.